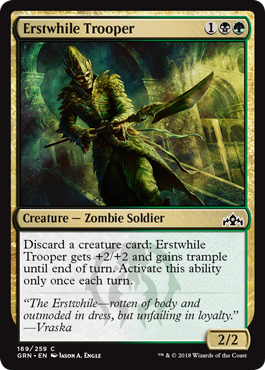 Erstwhile Trooper is going to play well in most Golgari decks. You need a high creature count (16+) to make it good, and once you have that it’s quite the brick wall. Imagine dropping this against a Boros deck on 3. If they don’t have a trick, they will rarely be able to attack into it, and even some of the tricks lead to a 2-for-2 trade. It also fuels undergrowth as needed, and even gains trample, so it can be a good way to start closing out games.